Here at the beginning of the 21st century, design and ideas can be disseminated in moments, entering the global consciousness. Yet despite such a broad platform, it is still individual creativity and bright sparks which drive designers. The scope of these contemporary designs is vast, ranging from architecture to lighting to domestic objects to logos to packaging and more. New materials and processes broaden the field, making sophisticated use of recycled materials, such as skips remade as gardens, or odd glowing balloon lights made from animal off-cuts. Rapid prototyping also makes all sorts of intricate constructions now producible in complex skeletal furniture. Design remakes and rethinks the ordinary in surprising ways. This is an exciting read, packed with brilliant memorable ideas. Some may already be familiar in corporate use, others speak of a bright future when designs become borrowed and spread out. Some products seem faddy and unlikely to catch on – a table that converts into a skirt, anyone? In cutting edge buildings and interiors we may experience use-friendly technology incorporated within the best of modern aesthetics. 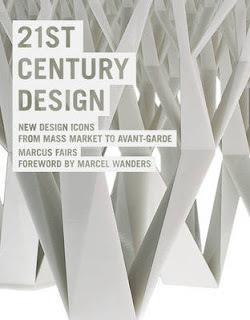 A catalogue of what is going on now which may design our lives tomorrow.